SpaceIL, a former team in the defunct-but-resurrected-without-a-sponsor-or-any-prize-money Google Lunar X Prize, has announced plans to launch a landing vehicle to the moon in December with a landing date of Feb. 13, 2019. The Times of Israel reports the team is working with state-owned Israel Aerospace Industries (IAI) and that the Israeli government will be paying for 10 percent of the mission cost. 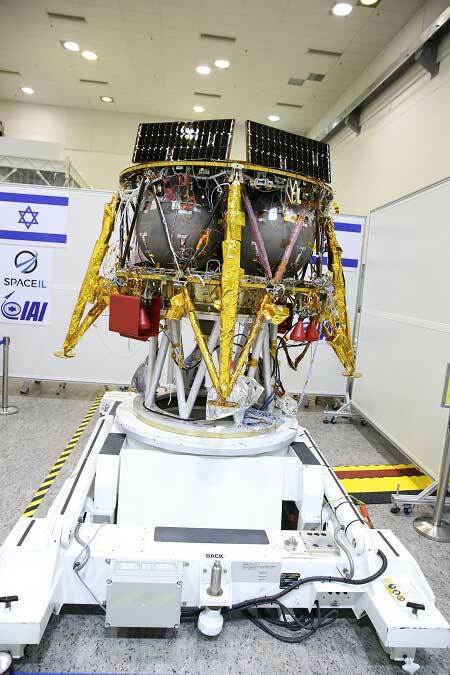 SpaceIL plans to launch the spacecraft as a secondary payload aboard a SpaceX Falcon 9 booster. After it lands, the 600-kg (1,323 lb.) vehicle will unfurl an Israeli flag, photograph its surroundings and measure the moon’s magnetic field. The surface mission will be completed in two days. The lander will not be carrying a rover capable of traveling 500 meters across the surface. This was one of the requirements of the decade-long Google Lunar X Prize, which ended in March without no one claiming the $10 million first prize. Any idea what flight this is co-manifested on? The only one looking like December right now is Falcon Heavy with ArabSat-6A. SpaceIL previously announced they were booking through Spaceflight Industries, but their GTO rideshare seems to be further out than December. When are the others going to go? SpaceIL never intended on carrying a rover. The idea was that it would use excess fuel to “hop” 500m from the original location. One problem I have with this mission is they’ve failed in creating a “cheap” moon lander (compared to government programs), which was the point of the prize. Their mission will cost $95 million, according to the Times of Israel. Meanwhile the Indian government Chandrayaan-2 mission costs $125 million. That’s a 30% discount, but that’s not a lot when you consider Chandrayaan-2 has an orbiter and a rover as well as a lander, has way more scientific instruments, will analyse samples from the moon itself, and the rover will go a distance several hundred times the 500m SpaceIL originally planned. I hope one of the other X Prize participants will work out how to do it cheaper than this. To my Jewish brothers, Shalom….I hope this mission goes well. It’s possible Muslim Imams may end up being offended by the mission, since many Muslim Imams consider the moon sacred. Now you know why there are so many moon symbols in Islam. Agreed for the most part, but I don’t see any sign that the Chandrayaan 2 rover will be able to travel as far as you suggest. I would think it will be lucky to equal the 500 m distance. It is not intended to survive the night, though that might happen. From my point of view the biggest problem with SpaceIL is that they seem (as far as I know) to have no continuing plan. The mission is a one-off. Other GLXP teams had intended to fly a series of missions, and still do according to most of them.